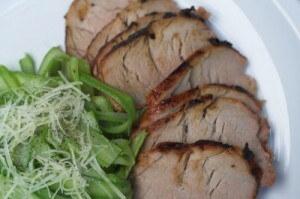 Pork tenderloins are typically about a pound each and come packed two to a package. Before cooking, use a sharp knife to carefully remove the white membrane (called silverskin) from each one. Preheat the oven to 400 degrees. Brush the pork with a little olive oil. Mix last four ingredients and coat pork with the mixture. In a heated skillet, brown the tenderloins on all sides and set aside on a baking sheet that has been sprayed with cooking spray. Bake the tenderloins for about 8-10 minutes until the internal temperature is 160 degrees. Let the meat rest before serving. Serve with a sauce of balsamic vinegar reduced by about half. A Merlot or Pinot Noir would go nicely with this dish.